The cannabis industry is becoming increasingly attractive to investors, who are pumping more money than ever into marijuana companies. One indication of the increased activity: In 2015, cannabis companies secured more than $215 million in venture capital, according to data from the investment research firm CB Insights. The infusions came in the form of 98 separate investment deals, including 30 in the fourth quarter alone. By comparison, CB Insights – which tracks venture capital investments in the United States – reported just nine deals totaling a mere $9 million for all of 2013. Chalk up the growth to several factors, including the emergence of new state medical and recreational marijuana markets, a surge in interest by mainstream investors and increasing acceptance of cannabis across the country. The CB Insights reports likely don’t include every venture capital deal each year, as investment activity can be difficult to track in the cannabis industry. But they do provide a solid picture of the overall investment climate, which has improved markedly for marijuana companies by many measures. 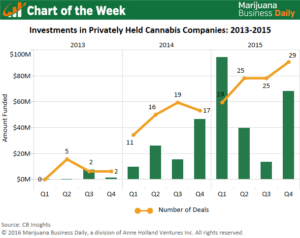 Aside from growth in the number of deals and the overall amount invested, cannabis companies are also landing larger infusions of venture capital – often several million dollars, as opposed to hundreds of thousands of dollars two years ago. The investment climate has continued to improve this year, with numerous companies – from those vying for dispensary licenses to cannabis business management firms to MJ software companies – landing seven and even eight-figure deals. The current activity is likely just the tip of the iceberg. Several new medical cannabis markets will open in the coming years, including Pennsylvania and Maryland. That will provide investors with new opportunities to get involved. Several states also could legalize medical or recreational marijuana this November, further increasing investment opportunities. You should track the activity of startups raising funds through the new equity crowdfunding that came online May 16th.